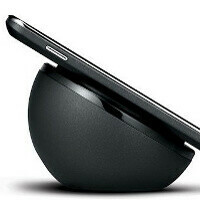 The Nexus 4 wireless charging orb has finally arrived on Google Play and you can now buy it for $59.99. Right now, shipping time is around a week, and if we ever wanted to get one, we wouldn’t be wasting any time remembering how quickly devices sell out on Google Play. The Nexus charging orb relies on Qi inductive charging technology to get your device juiced up with no wires, you just place the Nexus 4 on the orb and it recharges. The arrival of the coveted but elusive accessory that is the orb comes just in the middle of February, days after Google finally worked out Nexus 4 supply issues with LG, and the device is now widely available. Still, shipping times for the Nexus 4 are a couple of weeks, and hopefully that gets better over time. Technically speaking, is there anything else in it other than an adapter, a coil and a magnet? $60 is pretty crazy for something that should've been included in the package. (Google is excused cause of the Nexus 4 price, but I don't want a trend where dust off 6-800 bucks and $50 more for further $5 accessories, which is blatant rip-off. Thanks PA!!! messaged my brother in the States to order me one right away.. I liked my Nexus 4 well enough, although it is not the best phone I have owned. I was pretty eager for the orb when I had the 4. Now, if I still owned the N4, I wouldn't buy that orb for anything. All of the glass problems the N4 has had would make me cautious about setting it on anything that wasn't pillowy soft. First lets get my Nexus 4 shipped out first and then I'll order this. You need this accessory because you can't just swap out the battery when it dies. If only it was removable. I sure hope the next Nexus has a removable battery. Will this work with the Samsung galaxy s3?